“Maggie’s Plan” exists within a very specific, very recognizable cinematic realm: that of the intellectual, narcissistic New Yorker. Woody Allen established it; Noah Baumbach modernized it. Now, writer/director Rebecca Miller is visiting it with often amusing but mixed results. 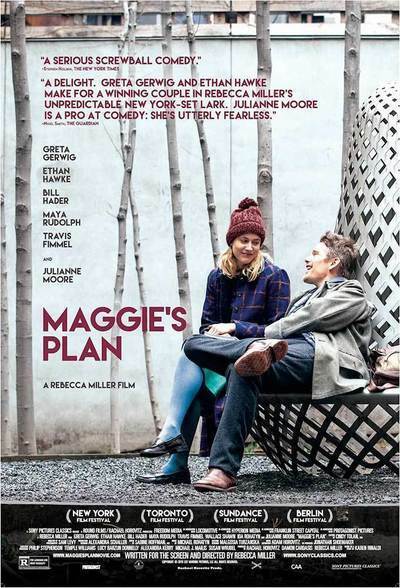 It’s a rare light comedy from Miller, best known for weighty dramas like “Personal Velocity” and “The Ballad of Jack and Rose.” But despite the machinations and manipulations of the film’s titular plot, “Maggie’s Plan” almost isn’t screwball enough. The characters must undergo some introspection, as well, and striking a balance between those two dynamics proves challenging. Baumbach’s muse and frequent collaborator, Greta Gerwig, also gives the film a feeling of familiarity as the title character. We’ve seen her play a version of Maggie many times before; it is her bread and butter. Maggie is guileless and enthusiastic—one sharp-tongued character aptly describes her as “a little bit stupid”—which gives a purity to her fumbling attempts toward maturity and stability. But Maggie becomes more emotionally entangled with the brilliant professor John Harding (Ethan Hawke), a renowned expert in the field of “ficto-critical anthropology” and a struggling novelist. She agrees to read his book—a thinly-veiled depiction of his unhappy life with his even more brilliant wife, eccentric Danish academic Georgette (Julianne Moore), with whom he has two kids—and she falls in love with it. In turn, John falls in love with Maggie—although he’s probably just in love with the way she makes him feel in comparison to his actual spouse, who’s chilly and intimidating. With her tight top knot and comically thick accent, Moore at first seems to be doing a spoof of a self-serious European intellectual. But because she can’t help but be excellent and provide insight into every character she plays, Moore reveals a vulnerability to Georgette that’s surprisingly compelling. This is especially true in her scenes with Gerwig. The two actresses have vastly different on-screen personae—Moore is all complex technique, Gerwig is all surface instinct—but together, they create a connection that’s unexpectedly pleasing and warm. Cut to a few years later. John has left Georgette and married Maggie. The two have a daughter together but also split time with John’s kids with Georgette (Mina Sundwall and Jackson Frazer). They seem happy—and Maggie is even thriving amid the chaos of balancing work and mothering three kids—but it doesn’t take long for John to wallow in misery once more. All this time later, he still hasn’t finished the behemoth book that brought him and Maggie together in the first place. This makes Maggie begin to question her own happiness—and question whether she even wants to be with John anymore. It’s a scheme as old as the hills, downright Shakespearean in its potential for lively antics and wacky misunderstandings. Unfortuantely, Miller dials it down and taps into everyone’s insecurities and existential crises, detrimentally draining the film of energy when it should be building to a climax. It’s a bold tonal decision, to be sure, but—not unlike the plan in “Maggie’s Plan”—it doesn’t quite turn out as expected.